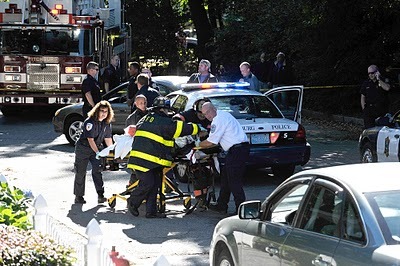 Wednesday, October 14, 2010--EMTs and firefighters perform CPR on a woman who was shot by police after the car she was driving crashed in Fitchburg Wednesday. According to reports, the police were pursuing the woman and another suspect in a high-speed chase that looped from Fitchburg into New Hampshire and back again before the driver crashed the car on Heywood Street. The chase stemmed after two suspects robbed Ray's Variety store in Fitchburg. Three police officers were injured, the woman shot was killed. The passenger of the car was arrested and charged with robbery.